The Cyclone Nargis struck Myanmar in May 2008, making landfall in the Ayeyarwady Division, approximately 250 km southwest of Yangon, and affecting more than 50 townships. 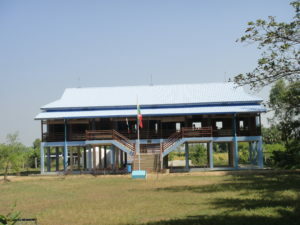 SDC decided to establish a project to reconstruct schools built to use as storm shelters in the Bogale/Pyapon Townships area of the Ayeyarwady Delta. Skat was mandated by SDC-HA to assess and provide child-friendly and storm safe shelter and school design options and to draft National School Construction Guidelines for Myanmar. Skat was mandated by SDC-HA to assess and provide child-friendly and storm safe shelter and school designs. This duplex task was challenging for the local project management since the sites are located in very remote places. The prevailing site conditions (weak soil-bearing capacity, high water table, land filling, need for constructive wood preservation and windproof roof structure, etc.) required the application of carefully selected construction materials and techniques. The design integrates local knowledge, internationally recognised structural engineering and quality standards. Integration of local communities and their needs was regarded as an essential aspect and formed part of an all inclusive approach. The project contemplated the construction of about 10 to 15 buildings serving as models for similar constructions in the delta. In a 2nd phase more than 70 schools were built under this project. The design served as a model for other INGO’s. Construction of more than 100 schools was implemented and is still on-going.